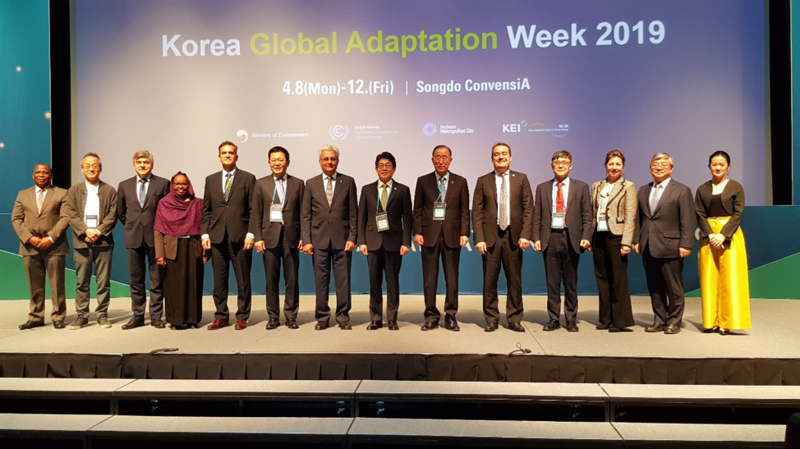 The 6th global NAP Expo successfully kick started in Songdo with the participation of over 300 experts and representatives from national and sub-national government authorities, the Green Climate Fund (GCF), United Nations organizations and other international organizations, bilateral and multilateral agencies, regional centres and networks, the private sector and academia. The high-level opening, graced by leading figures in climate change adaptation, set the tone of the NAP Expo this year. Changes in the climate is evolving much faster than expected and the impacts experienced are formidable but, at the same time, the global community is gearing up to meet these challenges with high level political forum such as the UN Secretary General ‘s Climate Action Summit in 2019. Photo 1. The high-level opening ceremony speakers at the NAP Expo 2019. The first day featured topics on climate risk analysis, climate data, adaptation of urban systems and human settlements. It also featured the launch of supplementary material materials to the NAP technical guidelines by four organizations – GWP, UNCDF, UN-HABITAT and NAP Global Network. Risk assessments and analysis is an integral part of climate change action. There is a correlation between adaptation policies and risk assessment. Effective adaptation follows a thorough and extensive risk assessment exercise. Where risk assessments miss critical information there could be consequences in terms of maladaptation and a mismanagement of resources. A common feature in risk management at any level, is that, decision makers face the challenge of selecting appropriate ways to manage risks associated with climate change impacts. In order to make decisions on priority actions actors have to understand the risk itself better. In most countries this understanding of risk is constrained by the lack of financial resources, capacity, requisite political will as well as the time available make these choices. Therefore, the design and packaging of climate risk assessment tools and information plays an important role in the ability of actors to produce useful risk assessments results. The management of climate risk data is an important component of how this data is accessed, interpreted and utilized. Developing easy to access and data interpretation products (such as dashboards) will ensure that users can easily interacts with the information that is at their disposal. Risk assessment may involve multiple components such as hazard mapping, assessments of the vulnerabilities and impacts, as well as the levels of risk tolerance in society. In an effort the speed the adaptation action through robust risk assessment, Prof. Dr. David N. Bresch of the Institute for Environmental Decisions at ETH Zurich and his team have developed CLIMADA. 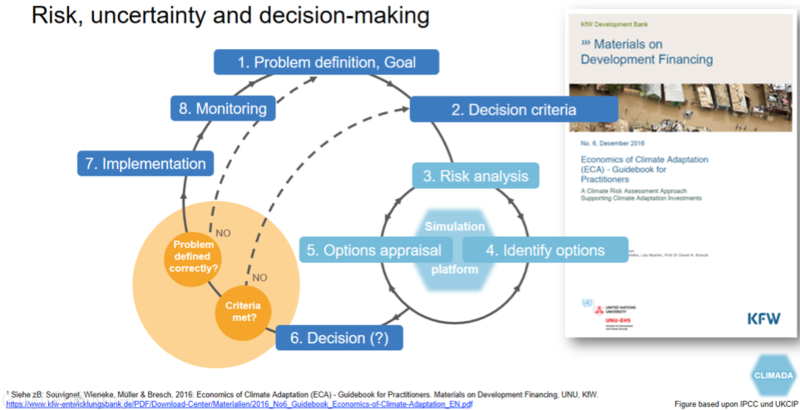 A decision support tool that helps decision makers (1) identify, (2) assess (quantify) risk today, including additional risk due to socio-economic development and climate change, and (3) propose, appraise and prioritize a basket of adaptation measures to address weather and climate risk on an economic basis. Figure 1: Framework for risk, uncertainty and decision-making. Source: Presentation by Prof. Dr. David N. Bresch at the NAP Expo 2019. Prof. Jean Palutikof, IPCC Expert and Director of the National Climate Change Adaptation Research Facility of the Griffith University in Australia reiterated that while these tools are important, it is critical to ask whether most of them truly address user needs. Relevance, accessibility and trustworthiness of decision making tools are its most important attributes (see figure 2 below). To achieve this in decision support tools, it is necessary to consult extensively with potential users at all stages of design and implementation in order to also support the building of a comprehensive knowledge about climate change, its impacts and possible response mechanisms. 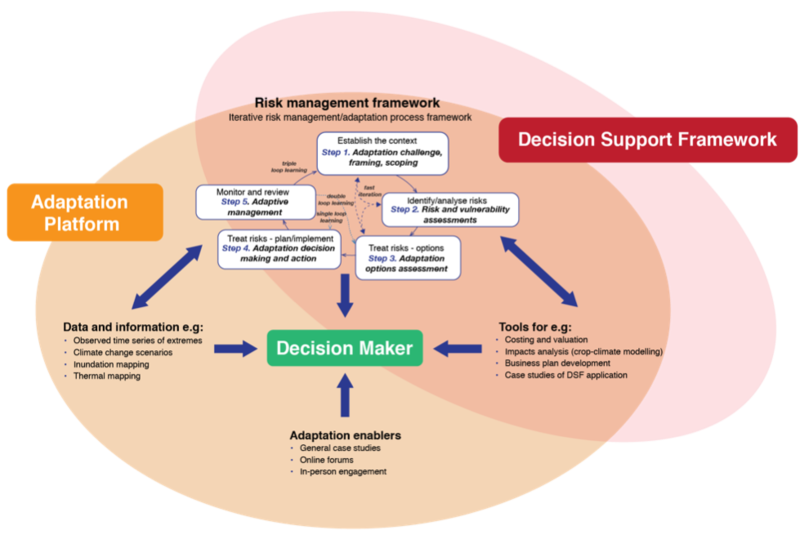 Figure 2: Iterative risk management/adaptation process framework. Source: Presentation by Prof. Jean Palutikof at the NAP Expo 2019. Reliable, relevant, usable and timely climate information are the foundation of climate risk management decisions that inform the implementation strategies of the National Adaptation Planning (NAP) process. Adaptation should be based on the best scientific knowledge on climate. Research, systematic observation of the climate system and early warning systems, are major components of climate services that supports decision-making and help understand the risks. A number of elements in the NAP process require effective and timely climate services. 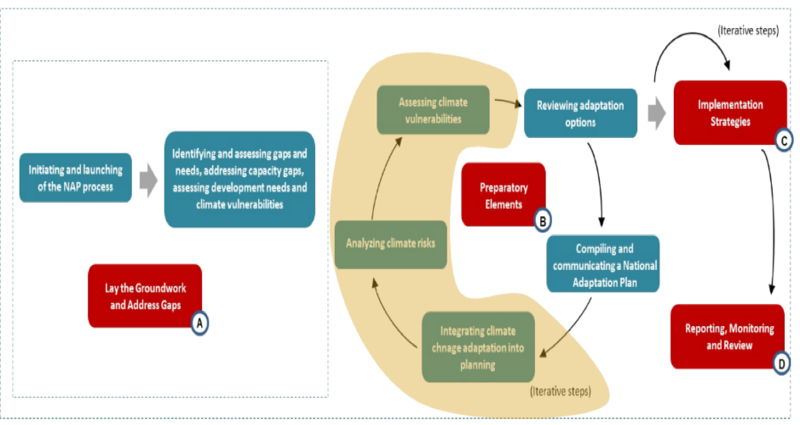 These include assessment of climate vulnerabilities and identification of adaptation options, development of products that help improve the understanding of climate and its impacts, and enhancement of capacity for planning and implementation of adaptation. Climate services should cover full value chain of socio-economically relevant sectors as adaptation and resiliency is always required whether it is climate variability (short term and natural) or climate change (long term and human-made/influenced). Analysis of historical data is not just for climate normal, it informs us about the trends in extremes and high impact events, while multi-year climate prediction and decadal projection serves better project planning, as the uncertainties are very high for the end of century projections. Sources of climate data and scenario based on well-tested and quality-assured global and regional datasets as well as decision support tools are available to developing countries that can be used for the NAP process. This can help sectors, such as water and agriculture which are among the highly prioritized areas of adaptation action in the submitted NDCS, respond to climate change. Figure 4. The Climate Services for Supporting Climate Change Adaptation will be launched by end of June 2019. 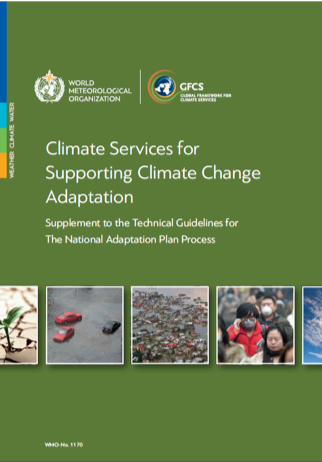 The Global Framework on Climate Services was launched in 2009 to support the development and incorporation of science-based climate information into policy and practice. Under this framework, the World Meteorological Organization and the United Nations International Training and Research developed a training package intended to promote the incorporation of improved climate information in NAP preparation and implementation. The aim of the course is to bridge the information and communication gaps currently affecting the demand for climate information services and their supply. The WMO also works with an international team of climate scientists dedicated to improving the availability and consistency of sector-specific climate indices through the creation of software, regional workshops, research, and training materials. More importantly, the WMO strengthens National Meteorological and Hydrological Services (NMHS) capacities to incorporate risks in policies and project documents. There are also free and open access climate change services available on the web such as the EU Copernicus Programme and the Climate Data Store, a one-stop shop for information about past, present and future climate. It also has an online toolbox that allows users to build workflows and applications suited to their needs. Copernicus services also include atmosphere monitoring, marine environment monitoring, land monitoring, climate change, emergency management and security. A keynote by Ms. Kotchakorn Voraakhom, the CEO and founder of Porous City Network, offered practical examples of urban infrastructure solutions in Bangkok, demonstrating how urban architecture can help protect and improve the health of urban ecosystems and thereby increase their resilience and adaptive capacity. The examples included creation of green spaces, parks, buildings, and linkages, integration of flood water storage in urban infrastructure design, urban farming, and city waterways and canal restoration (see figure 5 below). This was complemented by further examples and evidence in subsequent sessions on how urban green spaces and architecture can play important functions as green-blue grids for making cities more sustainable and climate resilient, beyond often being seen from their aesthetic value. Figure 5: Landscape architecture solutions for a sinking city. Source: Presentation by Ms. Kotchakorn Voraakhom at the NAP Expo 2019. A session led by the UN-HABITAT demonstrated the growing importance of adaptation of human settlements in both national and subnational planning contexts. A guide on “Addressing Urban and Human Settlement Issues in National Adaptation Plans”, which serves as the supplement to the NAP technical guidelines will help countries in strengthening the integration of human settlements in their NAPs. A strong climate rationale is required for countries to demonstrate the climate risks in settlements and hence the prioritization of adaptation measures. A series of Open NAP sessions will be conducted throughout the week. Discussions kickstarted on the first day with the introduction of the concept. The Open NAPs is an initiative by the LEG to demonstrate technical adaptation planning concepts, testing and developing new innovative approaches, and developing good practices, based on experience with real country situations. 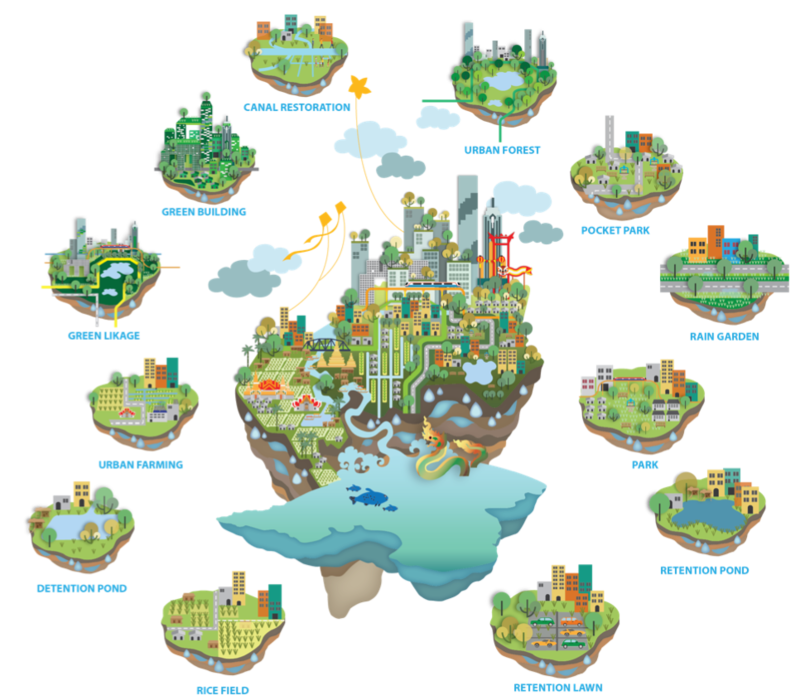 A crowdsourcing approach is used to attract specialists in different areas of adaptation planning. It also promotes and motivates wider use of major regional or global products– ensuring use of best available science. Figure 6: Sample diagram of the Integrative Framework for National Adaptation Plans and Sustainable Development Goals by the LDC Expert Group. Countries particularly LDCs are encouraged to take advantage of this initiative to better understand and frame how they use the approach in a manner that suits their circumstances. The Integrative Framework for NAPs and SDGs was also introduced in the Open NAPs session. 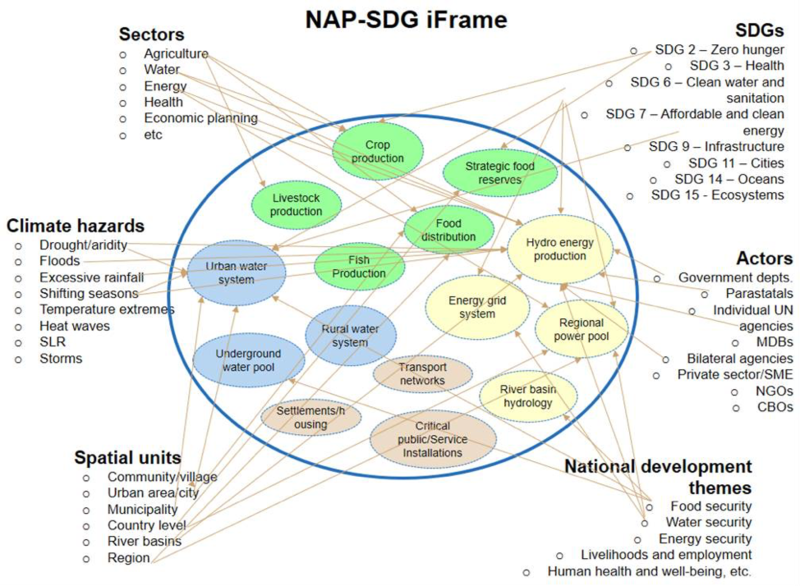 The NAP-SDG iFrame takes an integrated approach towards country-driven and country-specific descriptions of systems that should be managed to achieve adaptation and contribute towards achieving SDG targets. 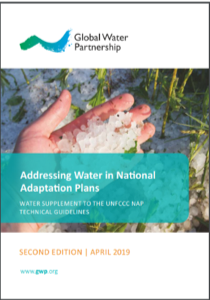 The Global Water Partnership launched the supplement on “Addressing Water in National Adaptation Plans – Water Supplement to the UNFCCC NAP Technical Guidelines”. The supplement aims to support countries translate their water-related resilience priorities to action in the process to formulate and implement NAPs and coherently delver towards the Paris Agreement, the Sustainable Development Goals, and the Sendai Framework. 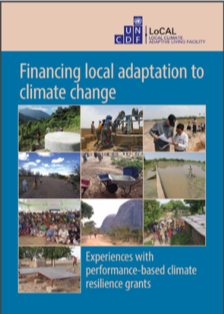 The United Nations Capital Development Fund also launched supplement on “Financing local adaptation to climate change: Experiences with performance-based climate resilience grants”. The supplement provides countries with a mechanism on how to integrate climate change adaptation into local governments’ planning and budgeting systems, increase awareness and response to climate change at the local level, and increase the amount of adaptation finance available to local governments. 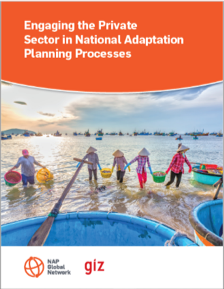 The NAP Global Network introduced the supplementary guidance “Engaging the Private Sector in National Adaptation Planning Processes” to governments and their partners. As public sector finance alone will not be enough to finance NAP processes, there is increasing recognition of the need to engage the private sector in financing adaptation. The United Nations Human Settlements Programme launched a guide to Addressing Urban and Human Settlement Issues in National Adaptation Plans. 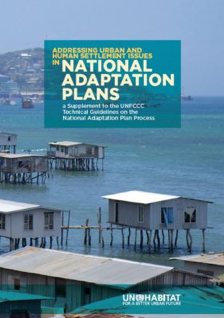 The supplement highlights the crucial role of scaling up climate action by integrating human settlements into national adaptation planning and processes and promote the process of building resilient nations. The integration requires close cooperation and coordination between national, sub-regional and local governments as well as key private sector and civic society actors.